The fourth track on the Elton John album is the thirteenth vlog posting. No Shoes Strings On Louise, is one of Elton’s first recordings to exult Elton’s love of America’s country music. This song is definitely one of the lesser known and discussed tracks on the album, but happens to be one of my favorites. Musically, the song is a straight-forward country number in 6/8 time. 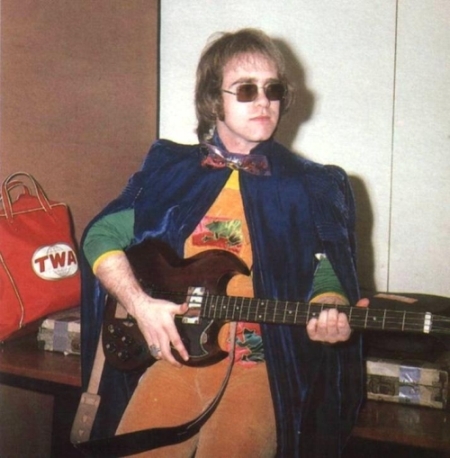 6/8 time is a time signature that Elton has not frequently used. However, he has often used country stylings in his music, showing his utmost respect for the genre. This song seems like it would have fit better on Elton’s follow-up to his self-titled album, Tumbleweed Connection, which was a tribute/concept album about the American West. It may be why this gem of a country song really didn’t shine amongst an album of mostly singer-songwriter pieces backed by vast string arrangements. The country-style of this song wraps itself perfectly around the lyric. I can just picture a woman driving around some Texas town in her “big red Cadillac,” using the men around town as she so pleases. The is probably the first of many songs that Bernie would write about rather sexually active women (for lack of better terms); however, one might argue that many of Bernie’s lyrics with similar themes have bordered on sexism or chauvinism. None-the-less, Bernie once again does a great job of telling a colorful tale. I hope you enjoy my rendition of No Shoes Strings On Louise. When I saw this video, let alone the website, I about fell over dead. I’m a die hard Elton fan, and this is absolutely my favorite Elton song (along with Mona Lisas and Mad Hatters). I would kill to be able to play this on the piano as well as you can all of them. Thank you so much for your kind words! Mona Lisas is one of my all time faves too. It will be up here eventually!